Mohandas Karamchand Gandhi was the Leader of the Nationalist Movement and Face of India's Struggle Against the British colonization of India. Due to His Preaching and Practice of Non-Violence and his Continuous Struggle Towards the Independence of India, He is Considered Bapu or 'Father of the Nation'. The Honorific Title of Mahatma is Often used as a Prefix with his name, Which Means 'a Great Soul in Hindi. He is Commonly Referred to as 'Gandhiji'. He is the Leader of Various Civil-Rights and Non-Violence Movements Across the Country and Inspired many Movements Across the World. Though Mahatma Gandhi was born in a Hindu Merchant Class Family, he Respected every religion. As he is Considered the Epitome of Non-Violence, his Birthday 02 October is Celebrated as International Day of Nonviolence. Mohandas Karamchand Gandhi was born on 02 October 1869, in the city of Porbandar (Gujarat, India) to Government Officer Karamchand Uttamchand Gandhi. While he was Still Learning at School, at the Age of 13, He was Married to 14 year Old Kasturbai Makhanji Kapadia or Simply known as Kasturbai. Gandhi had four sons with Kasturbai. After Gandhiji's Father Passed away, his Uncle Suggested him to go to London to Study Law. In 1888, at The Age of 18, Mahatma Gandhi Went to London. Along with Studying law and Jurisprudence, he came in contact with a few members of the Theosophical Society, who Encouraged him to read holy book Bhagavad Gita. He Became a barrister in 1891 and left for India, only to learn about his mother's death. Mahatma Gandhi Failed to Continue his law Practice in India properly. He was Contacted by a Shipping Business Owner Dada Abdullah, Who Asked Gandhiji to Take up the Case of His Distant Cousin in Johannesburg (South Africa). Gandhiji considered Russian Leo Tolstoy as His ideal and thus Started Satyagraha (devotion to the truth) and used Non-Violence to Fight back the Discrepancies in the South African system. Gandhiji Furthered his Idea of non-violence by setting up an Idealistic Community 'Tolstoy Farm' near Johannesburg. Gandhiji was Awarded Queen's South Africa Medal for his works during the Boer Wars. He spent a total of 21 years in South Africa. Political Leader and Activist Gopal Krishna Gokhale Persuaded Gandhiji to return to India and Participate in the Struggle of Independence. Gandhiji later Joined Congress. Gandhiji's first Involvement in the Independence Struggle Came in 1917 When he Went to Champaran (Bihar) in view of the Growing agitation by Peasants. Peasants in Champaran Were Forced to Grow Indigo, which fruited less profit for the farmers and the lands were becoming less fertile. Gandhiji staged a Satyagraha and forced the Authorities to Provide Some Concessions with the order. The Farmers in Kheda part of Gujarat were Unhappy as the Authorities were not Willing to provide relief from the taxes in wake of the floods and Famine in 1918. Gandhiji went to Kheda along with regional leader Vallabhbhai Patel. He asked the farmers not to Cooperate with the revenue officers. Initially the demands were not met with but few months later the officers agreed upon a temporary exemption from taxes until the famine ends. In 1919, after the defeat of Ottoman Empire in World War I, the Muslims in India were upset with the British Government, as they considered Turkish Caliph as the Ummah and Britain was invading Turkey. Gandhiji supported the cause of Ali brothers and the Muslim League, thereby garnering their support and creating a bridge between Hindus and Muslims. Hence Khilafat movement was started to oppose the British imperialism. In February 1919, Gandhiji initiated the Non-Cooperation movement against the Rowlatt Act, by which Police could detain and take into custody, any non-working Indian government official and press charges. Gandhiji asked people to boycott British made goods and clothes, also to accept the swadeshi policy. People joined the movement in large numbers and burned their British-made belongings. The movement however took a halt when a British officer Reginald Dyer surrounded people who gathered for a meeting at Jallianwala Bagh (Amritsar) and ordered his troops to fire on them. There were heavy taxes levied on production of salt. Gandhiji was against it and decided to lead a march towards Dandi. He marched from Ahmadabad, along with huge crowds, 388 kilometers through 12 March to 6 April, to reach Dandi. He made salt himself. Eventually he was arrested. A total of 60000 people were arrested. When Gandhi-Irwin pact of 1931 and several 'round-table conferences' fruited no results, Gandhiji, in Bombay session of the All-India Congress Committee on 8 August 1942, called for Quit India Movement. He requested fellow Indians not to join the British Army and to fight in the World War. He told the British Government that they should expect any support from the Indian side only if they promise to grant Independence. 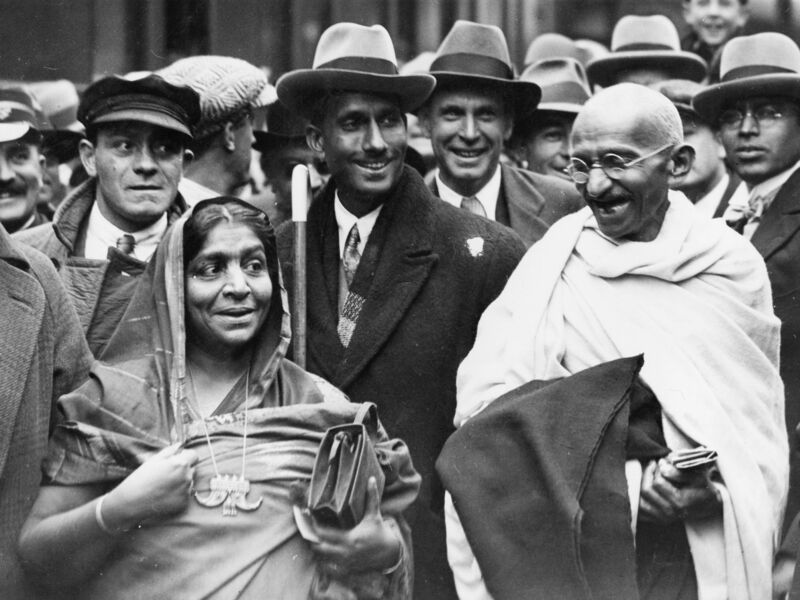 The British Government tried convincing Gandhiji with a long promise of Independence after the war. He urged Indians to Do or Die (Karo ya Maro), as in to fight for their rights or die trying. Gandhiji was arrested and released only when his health deteriorated, in May 1944. After the World war ended in 1945, when Britain was no longer able to contain India's continuous Independence struggle, they conceded to the demands of Indian politicians and agreed on granting Independence to India. Though the British parliament, well aware of the demands of Muslim League and growing disparity among two major groups of India, took advantage of it decided to divide the Indian state into two parts: A Muslim dominated Pakistan and a secular Indian half. Louis Mountbatten, the last Vice-Roy of India, supervised the process and on midnight 15 August 1947, India was granted Independence from British imperialism. ➯ "The woes of the Mahatmas are known only to the Mahatmas"
➯ "An eye for an eye will make the whole world blind"
➯ "As we didn't know much about marriage, for us it meant only wearing new clothes, eating sweets and playing with relatives."